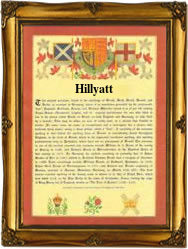 Recorded in a number of spellings including Hillett, Hillitt, Hillatt, and Hillyatt, this is an English surname. It is a diminutive or patronymic form of the pre 7th century Olde English and Anglo-Saxon personal name 'Hille' itself a short or developed form of Hild, Hildigard or Hildebrand, famous female names of ancient times. As 'Hille' it translates as 'battle', and as such was probably given as a baptismal name. Clearly female assertiveness is nothing new, and this name would seem to be proof of their standing in the days of tribal warfare. The suffix element of 'att or ett' is a short form of the French 'petit', and meaning 'Little Hille' or in some cases, 'son of Hille'. The surname appears in the surviving church registers of London in the 16th century. These registers were instituted by King Henry V111 in 1535, and first used in the diocese of Greater London, although it was over a century later that registers were adopted in many outlying parts of the country. These early recordings include examples such as: Presylla Hillyat at the church of St brides, Fleet Street, on August 14th 1597, Herbert Hillatt, who married Ann Beard at St James church, Dukes Place, on January 10th 1666, and Mary Hillitt, the daughter of Symon Hillitt, christened at the church of St Botolphs without Bishopgate, on December 6th 1747, all city of London.